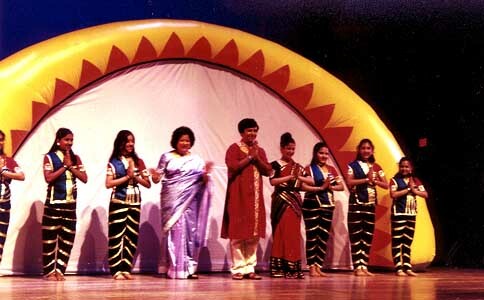 "Sorcar honored at Missouri U. event"
The long-awaited Banga Mela's (Festival of Bengal) main curtain opened to a spectacular evening scene of rural Bengal with stylized full size decorated hut, surrounded by massive waves of water, hundreds of lighted lamps, a crescent moon and twinkling stars - all designed by Manick Sorcar. Sorcar’s troupe comprised of eight talented world touring performers. The show started with the ladies dressed as villagers moving gracefully with lamps in their hands as they performed a dazzling Lamp Dance to the music of Ananda Shankar. This was followed by Bengal Forever, a ten-minute laser show capturing the milestones of Bengal's 2000 year-old history. 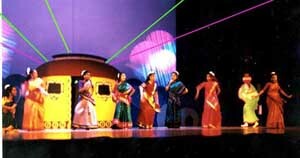 And finally, the Opening Ceremony was concluded with Celebrate Bengal, an extravaganza of a series of nostalgic songs and dances choreographed by his daughters Piya and Payal and performed by Sorcar's troupe amidst colorful Bengal-thematic lighting patterns from state-of-the-art lighting and dazzling beam shows by powerful overhead laser. The entire Opening Ceremony with his innovative items were so awesome and appealing that Sorcar and his team received a standing ovation from the cheering crowd of the packed theatre. Honorary Plaque was given to Manick Sorcar by Dr. Martha Gilliand, the Chancellor of University of Missouri, Kansas City. Manick Sorcar received an honorary plaque from Dr. Martha Gilliland, the Chancellor of University of Missouri, Kansas City, in grateful acknowledgement and appreciation for his commitment, contribution and distinguished service (in promoting Indian culture) to this community. 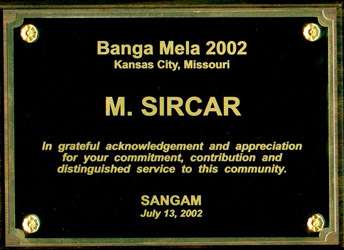 Sorcar was an invited artist to design and perform the Opening Ceremony of the Banga Mela cultural program held at the prestigious Performing Arts Center of the University of Missouri in Kansas City, co-sponsored by the university and Sangam. The festival was attended by eminent personalities of USA and India, and was inaugurated by Chancellor Gilliland, and Randy Pembrook, Dean of Conservatory. Due to popular demand, Sorcar showcased additional stage performances by his troupe later in the evening as his team performed Dancing with My Soul and Takita. Both items were also regarded as an extravaganza of live performance with laser animation which received another standing ovation.